Christopher Pierce Hoover, age 18, was a resident of Walworth, WI and formerly of Port Barrington, IL and Tomahawk, WI. Chris passed away suddenly and as his niece Piper said, he was the very best person to whoever knew him. We know that his dreams will live on through others. It only takes one person to help, create or do something huge. 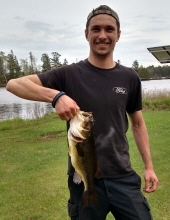 Chris was an avid outdoorsman who considered himself a "Northern Redneck". He has caught some amazing fish in his 18 years and loved hunting, snowmobiling, ATV riding target shooting and anything outdoors. He loved animals, cooking and had the biggest heart of anyone we have known. His favorite place in the world was Cable Lake, MI at the family cabin. Chris is survived by his parents, William & Wendy Hoover and Lisa & Michael McGreevy, brothers Justen Lyon (Jessica), Curtis Hoover (Ashley), Austin Hoover, Zane Hoover and Alex McGreevy, sister Cassandra Hoover (Rory Updike), niece Piper and nephew James, and grandparents Chris & Dan Micek and Curt & Dee Hoover. He also was surrounded by aunts, uncles and cousins too numerous to list. Visitation will be Friday, February 1, 2019, from 2:00 pm to time of Memorial Service at 5:30 PM at Kisselburg-Wauconda Funeral Home 235 N. Main St., Wauconda, IL 60084. In lieu of flowers, the family is requesting donations to the Wauconda Police Explorers, 311 S. Main Street, Wauconda, IL 60084. To send flowers or a remembrance gift to the family of Christopher Pierce Hoover, please visit our Tribute Store. "Email Address" would like to share the life celebration of Christopher Pierce Hoover. Click on the "link" to go to share a favorite memory or leave a condolence message for the family.